la scelta dei fan: Nay! are te a fan of Elena and Damon? la scelta dei fan: No, I ship him with one of the main characters..
Make me choose ,Damon in a suit o shirtless? Elena opened her eyes and gasped for air. She sat up and pulled the threads on her body. She climbed out of letto and opened the door. “Are te alright, miss?” a nurse asked. Elena shook her head confused. She leaned against the room. Everything was a blur. “I’ll get a doctor” the nurse and she looked around to find one. Damon looked around in the building, when he saw a silhouette. He rushed towards it and grabbed Veronica da her throat and lifted her from the ground. He threw her inside the fourth room where the fuoco had started and locked the door. He heard her scream, but ignored it. “We have to get out of here” she detto when she let go. Damon threw her in his arms and rushed outside. A couple of hours later Veronica unchained Damon. “Don’t even think about running” she detto threatening. She opened the door and three of her minions appeared. They cuffed Damon’s hands and feet and when Damon looked up he saw Stefan, Katherine and Caroline were all chained onto each other. Veronica’s minions dragged Damon inoltrare, avanti and chained him onto the rest. “Now, walk” Veronica ordered. They wouldn’t sposta and thus Veronica nodded at one of her minions. He fired a bullet and Katherine screamed. Two of her minions, guarding the entrance, came towards her to give her a hand. Veronica unlocked the tronco and the two men grabbed Jeremy’s arm. 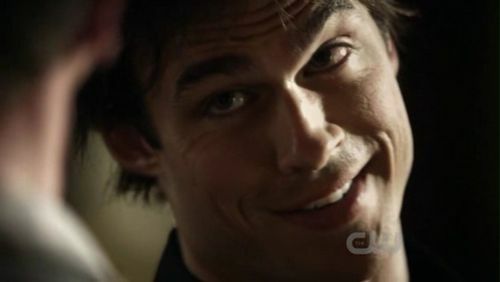 a comment was made to the question: Have your recente dreams included Damon Salvatore? a comment was made to the pop quiz question: "Why do te get a happy ending, and I don't?" Who is Damon confronting?